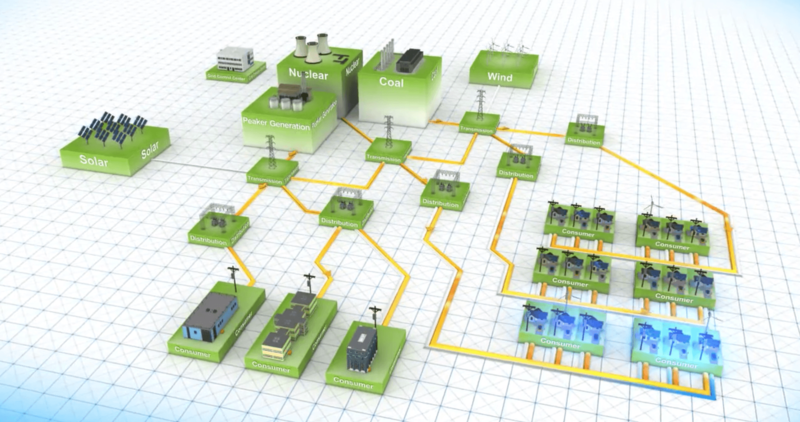 Smart grid and buildings standard emerges. Integration and automation possibilities to accelerate globally. A new standard developed by SGIP, NEMA, and ASHRAE marries smart grids with buildings in a proactive way. The standard is called the “Facility Smart Grid Information Model (FSGIM) standard,” or 201P, and it was published earlier in June. I personally think that this is a game changer, as we finally have a standard that joins the smart grid infrastructure built by utilities with the infrastructure used within buildings to manage energy systems. 201P FSGIM will open the door for power users to participate in smart grid networks. The 201P FSGIM standard provides a way to model real building systems as a combination of four abstract components: loads, generators, meters, and energy managers. The kinds of functionality that will be enabled by the model include on-site generation management, demand response, electrical storage management, peak demand management, forward power usage estimation, load-shedding capability estimation, end-load monitoring (sub-metering), power quality of service monitoring, use of historical energy consumption data, and direct load control. 201P FSGIM provides a common framework to guide the development of these control technologies so that they can meet the control needs of a smart grid environment managed by a utility. Furthermore, 201P FSGIM leverages other key industry standards, such as IEEE 61850 (generators), OASIS WS-Calendar, OASIS Energy Market Information Exchange, NAESB REQ Business Practices, OpenADR, and Weather Exchange Model (WXXM). The possibilities that 201P FSGIM opens for vendors and power users are tremendous. Imagine finally being able to ask your home (or building) for its expected CO2 footprint for the week, its estimated energy production and revenues, and its schedule for demand response events, all optimized by the rules and budget targets that you have set. Furthermore, imagine having the ability to sell your energy production to other customers, not only the utility, but within a utility service territory or even across multiple utility service territories or states wherever the rules allow it. In other words, 201P FSGIM enables transaction-based energy of distributed energy assets seamlessly. That is truly exciting. I also believe that Intel in particular is well positioned to leverage this new standard better than most and brings its vision of building IoT solutions to the market sooner rather than later. In the meantime, I am curious what kind of questions you might have that I can answer?